Last night was the first expected run of grunion of 2018. Missed it? No worries, there are plenty of additional opportunities to capitalize on the grunion run this year – starting with tonight! They are predicted to run Friday night from 9:55 pm to 11:55 pm, again Saturday night from 10:30 pm to 12:30 am, and ending their 4-night cycle on Sunday with a run from 11:10 pm to 1:10 am. And again, on every full and new moon from now through August. For a full schedule of expected runs and peak times, check out 2018 Expected San Diego Grunion Runs. Why should you be interested? They present an amazing opportunity at some of the best saltwater shore fishing from the surf that exists. 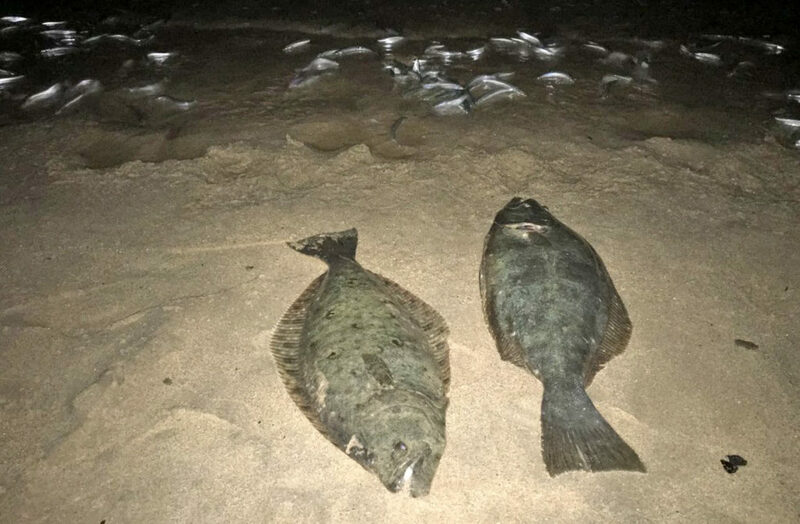 Their spawning ritual involves them beaching themselves to dig nests on high tides of full and new moons in the Spring and Summer months, making themselves vulnerable to anglers, and more importantly, predatory fish in the surfline. Halibut, corvina and calico bass are especially keyed in on the grunion runs, and feed heavily on these tasty and easy to catch treats. The CDFW has two grunion seasons – an open season (March, June, July and August) where they can be collected (by hand only) and an observation only (April and May) season, where they must be left alone. Persons 16 years and older must possess a valid California fishing license to capture them. There is no limit on grunion, though its against the law to waste them – so take only what you will use. Anglers can take advantage of the grunion runs in several ways. Obviously grunion make a tremendous baitfish, so collecting them during open seasons is a no-brainer, and fishing them live (either fly-lined or if the current is strong, a 1/2 oz egg sinker) is a great way to get the halibut or corvina of a lifetime. But they can also be frozen and then fished at any other point of the year and make a really hard to beat frozen bait for halibut, sharks, rays and even still the corvina and calicos. For those that prefer to fish artificials, fishing hard baits in the surf like Lucky Craft Pointers and Flash Minnows (110, 115, 128 size) or even simple spoons like Kastmasters or Krocodiles in smelt looking patterns is a great way to take advantage of the uptick in action from corvina and halibut. The grunion runs also present a rare opportunity to have a real legitimate shot at getting a halibut on topwater! Yes, that’s right – halibut which spend most of their lives sitting on the bottom – will actively feed on the surface. 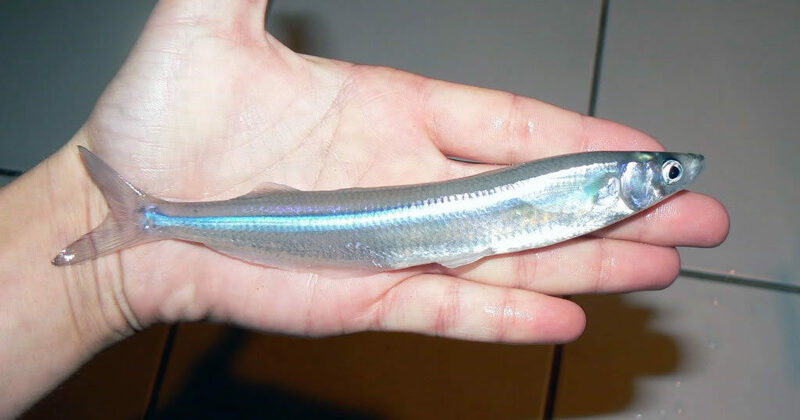 Super Spooks, Lucky Craft Sammies, and other walk-the-dog type topwater baits in saltwater baitfish patterns matching a smelt or grunion are good places to start your topwater pursuit of halibut and corvina. They can spawn on any sandy beach in San Diego, even in San Diego Bay. Gentle sloping beaches are best, and the more secluded the beach, the better for your odds of capturing them and then capturing the fish that are preying on them. Capturing grunion isn’t always as easy as it sounds – especially if you’re hunting for them around crowds. They prefer to carry out this ritual uninterrupted, so a bunch of bozos running around with flash lights, head lamps, and buckets is something they’ll avoid if at all possible. Try to find beaches without crowds, and limit your use of lights as much as you can (seriously, turn off the light). Use sounds (like halibut exploding on them) and active birds to locate the grunion instead of lights. Typically, the 2nd and 3rd nights of the 4-night runs are the most fruitful, and the 2nd-hour of the predicted run time each night is typically best. But mother nature doesn’t have a watch, so these predicted times are not always the absolute peak of activity. 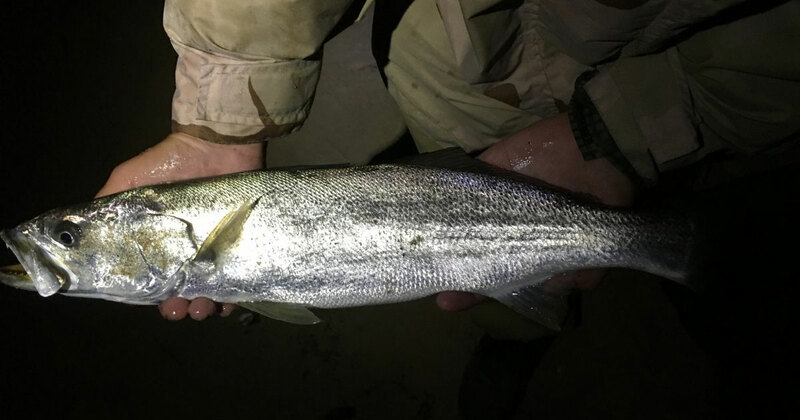 A nice 21″ corvina caught by SDFish member ‘sargo’ on a fly-lined live grunion. As for fishing around the runs, though the activity of predatory fish is definitely peaked right during the runs, some anglers prefer to fish following the runs, even the next morning’s low tide as there are less actual grunion to compete against, and still plenty of big fish lingering around hoping for another easy meal. For more information on grunion, check out the CDFW’s page on California Grunion Facts. The CDFW publishes this PDF document with more information on the runs, a printable schedule, and regulations (which there are a few to pay attention to). I’m new in town from Pensacola Florida and trying to find some great saltwater fishing here in San Diego . Back home I fished for flounder,speckled trout,red snapper, amberjack,grouper. I fish off the bank or from my paddle board. I would love to catch a halibut it’s on my bucket list. Truly any fishing is great.